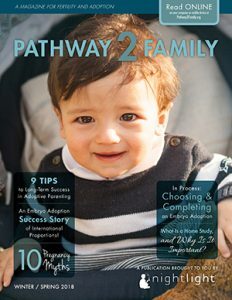 Here, you will find a variety of brochures that may be useful to your fertility clinic in educating your clients regarding embryo donation and adoption. None of these brochures have a copyright. Please fill out the form below to gain access to download the PDF versions of the brochure(s) to your computer. You may make as many copies as you would like. Learn about embryo donation and adoption in this pamphlet that is designed to give you everything you need to share embryo donation and adoption with your patients. Live Your Dream Brochure Learn how couples can realize their dream of pregnancy and give birth to their adopted child through embryo donation and adoption. Discover answers to several frequently asked questions that can help couples who are just beginning to consider embryo adoption. This card will help your patients learn about the four choices they have for their frozen embryos. It's a simple process, but an important action. Embryo Donation: Share the Hope This brochure is for people who have remaining embryos in frozen storage. It helps couples who have completed their family building consider the right disposition option for their family. This pamphlet is designed to provide clients with information about future options for their remaining embryos.